Earlier today at the Star Wars Celebration in Anaheim, thousands of people waited in line for a panel on the new installment, The Force Awakens. The panel featured discussions with director J.J. Abrams as well as some cast members new and old alike. After an up-close and personal look at the droid BB-8 and the new stormtroopers, fans were treated to this fantastic new trailer. According to rumors, this trailer will play in front of Avengers: Age of Ultron when it hits theaters in early May. Star Wars is back in town, and it looks like nostalgia has returned with it. If you’ll remember, I took an unnecessarily skeptical approach to the first teaser that was released in November. But the time for skepticism is over, because this trailer has brought me on board the “hype train” and I have a one-way ticket. Time to freak out. -Oh my gosh. This shot. This shot and this music. I’m geeking out. HOLY SMOKES IS THAT A STAR DESTROYER?! -Luke? Is that you? You sound okay for an old guy! -He kept it! He kept Vader’s mask! Think it could be restored? It doesn’t look half-bad for being thrown into a fire. -Where are Luke and R2 in this scene? Is that even Luke? Or is it just some guy with a robotic arm? With all the “arm slicing” in the series, it really could be anyone. Who am I kidding? It’s totally Luke. -The old Skywalker lightsaber! Who are these people? Why do they have Luke’s lightsaber? There are so many questions with this trailer! -“You have that power too.” Who is Luke talking to? Finn (John Boyega)? Rey (Daisy Ridley)? Kylo Ren (Adam Driver)? Me?! -This is gonna be a pretty great Christmas present. -X-wings everywhere, and Poe Dameron (Oscar Isaac) looks like a space cowboy. I’m glad there are still a few of those hanging around in the galaxy. -As someone who is excited to see the Star Wars universe grow, these are some of my favorite shots in the whole trailer. Seeing Finn and Rey run around with BB-8 is cool because it reminds you that this universe is still moving on and it’s still evolving. -Okay, so I wasn’t 100% on-board with Adam Driver as a villain when they first announced it, but his mask and really his entire costume look pretty dang cool. 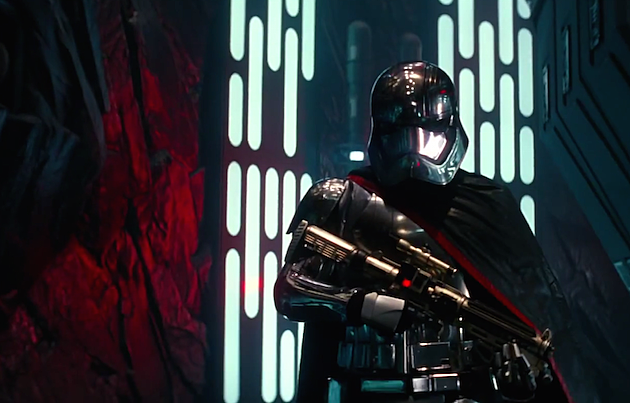 Also, I’m feeling a little bit more comfortable with that crossguard lightsaber. Looks really cool in action! -Stormtroopers! TIE Fighters! This is so awesome. While it looks new, it’s still got that classic vibe from the original series. That shot of the TIE fighter wrecking the hangar bay is so stinking awesome. -This guy. Or girl. Whoever he/she is, I like him/her. A lot. Just look at that awesome chrome stormtrooper shine. -This trailer reveals almost nothing plot-wise, but one thing is clear: Finn and Rey are going to team up and be friendos, and I can’t wait to see that. -That dogfight with the Millennium Falcon, while a little short, is THE coolest thing ever. I’m sure I’ve said that like 6 times now during this trailer. -“Chewie, we’re home.” Excuse me while I weep with joy. Star Wars: The Force Awakens hits theaters December 18, 2015.